Location: Mainland Orkneys, Scotland. Grid Reference: 58° 59' 56" N, 3° 11' 20" E.
The passage is orientated towards the setting mid-winter sun (behind the Hills of Hoy), and a blocking-stone left deliberately in the passage wall which can be opened and closed, controlled the entry of sunlight into the chamber. The site is in state care, and the opening hours are restricted, especially in winter. ‘Maes Hwyr’ - Celtic for ‘The field of the evening after the sun has set’. (16). Evidence from various excavations over the years has produced limited information. The passage and chamber were cleared of debris in 1861, when a fragment of human skull was found in one of the cells, along with some possible horse bones and teeth. Two trenches were cut into the north-east and south east areas of the ditch and mound in 1954-1955. Another cutting was made in the ditch and platform in 1973-1974, which showed that the surrounding ditch had originally been 2 metres deep. 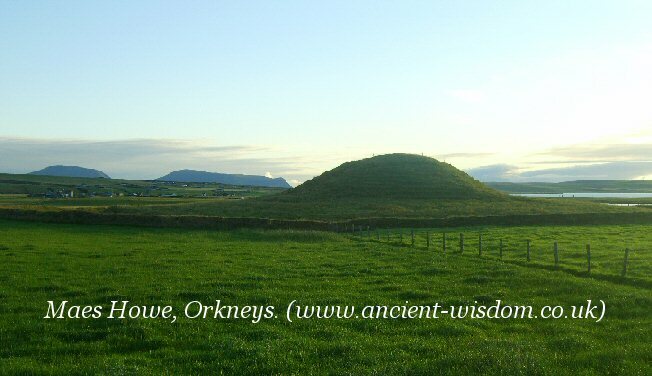 Maeshowe was broken into from the top by a party of Vikings in the 12th century, and they left over twenty sets of runic inscriptions carved on the walls of the chamber to record their exploits, as well as a carved lion and a serpent. As the original contents of the tomb are unknown to us, it is very difficult to speculate on rituals carried out at the site. The fact that the entrance faces SW suggests that the builders of Maes Howe had an interest in the winter sunset. At mid-winter, light from the setting sun streams through down the passage to illuminate the inner chamber. 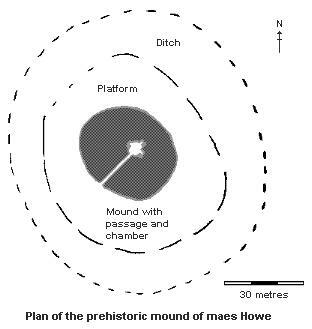 Schematic Plan of Maes Howe. The tunnel-mound is placed centrally within a circular ditch and bank of about 150 metres in diameter. The bank does not seem to be a true henge and it has been suggested that it is the remnants of the flat, circular, clay platform on which the mound stands. 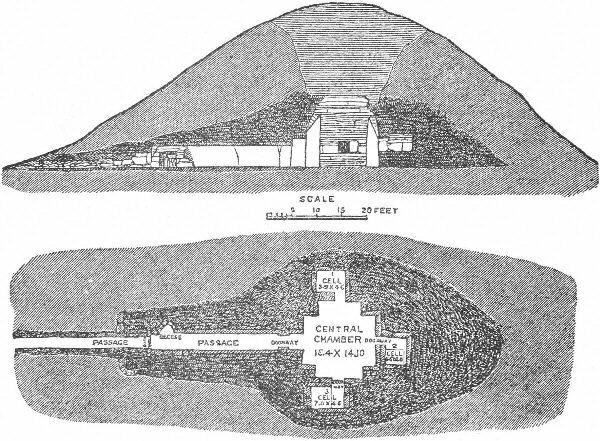 Radiocarbon dating for the bank and flat platform show it to be far older than the tunnel mound, dating from 3,930 BC. Whilst the structure itself dates from around 2,820 BC (16), 3,100 BC (1), 2,800 BC (2). The chamber is constructed with close fitting blocks whose surfaces have been chiselled flat or round according to purpose. They are accurately plumbed to the vertical, some being over 5 metres long and weighing up to three tons. The main passage had a triangular stone block which could be used to seal it. When the chamber was entered from the top by the Vikings in the 9th or 10th century BC, the left inscriptions saying that they found it empty. (16). This famous monument consists of a turf-covered mound over 7 metres high and 35 metres across, set on a level platform which is surrounded by an original ditch. (The wall outside the ditch is modern). Most of the mound beneath the covering of grass consists of clay and stones. The largest of these huge slabs are estimated to weigh around 30 tons (4). An entrance on the south-west side of the mound leads into a stone-built passage which is 1.4 metres high, and just under a metre wide. 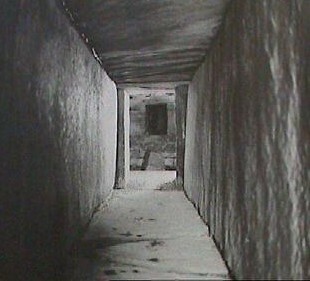 This passage runs straight inwards for over nine metres, and leads to a relatively high and spacious chamber in the middle of the mound measuring 4.5 x 4.5 metres. 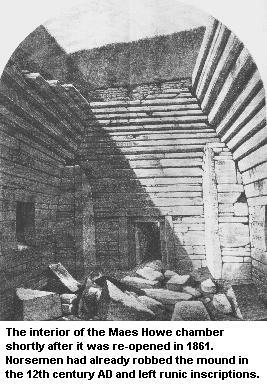 Vertical walls to head height are topped by sandstone blocks to create a corbelled vault. 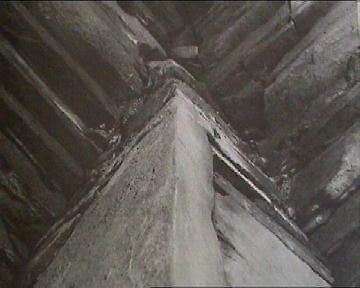 Each corner of the chamber has a buttress which serves to support the roofing. 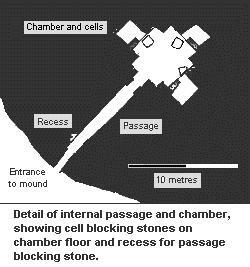 There are three recesses or cells in the chamber walls, set at just above waist height. A large stone lies on the floor in front of each of the cells, and these are likely to have been used as blocking. The stones for the passage and chamber have been carefully selected and dressed, and fitted together with care and precision. 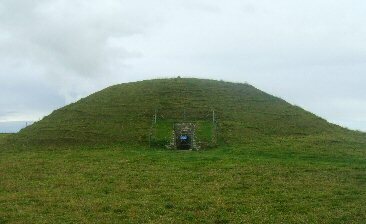 The cruciform chamber in the centre of the mound is vaulted by a corbelled roof, and has three small sub-chambers leading from it. Each of these sub-chambers would have originally been covered by large blocking stones, which now lie before them on the ground. It is noticeable that the same design was used on the main entrance to the passage of the chamber itself. Archaeo-astronomy: The entrance to the Maes-Howe passage-mound is orientated towards the setting winter solstice sun behind the prominent Hills of Hoy in the distance. The chamber was placed so that for several days before and after the winter solstice, the sunlight flashes directly into the passage not once, but twice, with a break of several minutes between each illumination. The passage is aligned facing Southwest, facing Ward Hill. For 20 days before the solstice and for 20 days after the solstice, the sun shines into the chamber twice a day. Every 8 years Venus causes a double flash of light to enter the chamber. This last happened in 1996 and will happen again in 2004. “At around 2.35 p.m. on the winter solstice, the sun shines on the back of the chamber for 17 minutes, and then sets at 3.20 p.m. At 5.00 p.m. the light of Venus enters the first slot, lighting the chamber, and then at 5.15 p.m. it sets behind Ward Hill. But 15 minutes after its first setting, Venus reappears beyond Ward Hill, and the light enters the chamber for a further two minutes, before setting for a second and last time”. (16). The passage faces south-west, towards the position of the setting sun between the hills of Hoy (see above)so that the beam of sunlight strikes the back wall of the chamber. Just inside the entrance to the passage on the left side there is a recess built into the passage wall. This recess holds a large stone, which was found in the passage during the excavations of 1861. This stone may have been used by the builders of Maes howe to block the front of the passage. The recess suggests that the blocking and unblocking of the mound could be carried out at will. The stone fits the width of the passage exactly, but leaves a strip above open to a height of 50cm. This feature is commonly referred to in connection to the light-box above the passage in the Neolithic mound of Newgrange in Co. Meath, which allows the light into the chamber at sunrise on midwinter's day. Light-boxes are a megalithic construction feature that have so far only been recorded at three (possibly four) sites in the UK, with the two in Ireland (Newgrange and Carrowkeel - below) both having the same design, and the other two on the Orkneys (Maes Howe and Crantit) in Scotland. All of these sites have been shown to have been deliberately constructed so as to allow the rays of the sun (and/or moon) into the interior of the passages for very specific time periods only. 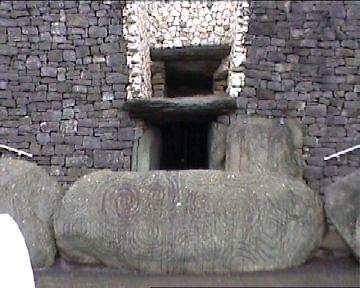 One of the stones from the light-box at Newgrange (right) has a particular design on it which can be found at two other passage mounds: Gavr'inis in France, and Fourknocks in Ireland. 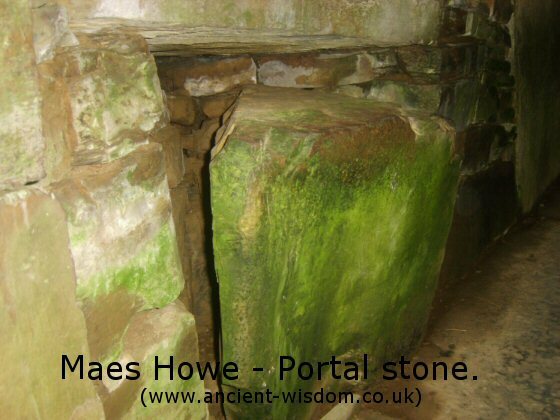 At Maes Howe, the light of the setting solstice sun was restricted by the closing of a 'portal stone', placed into the side of the passage. 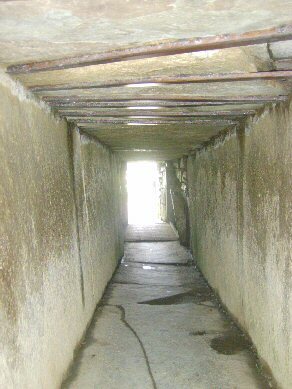 In this way, it is speculated that at the right moment, the stone could be closed across the passage, and the light would only pass over the top (as at Newgrange). The same design feature is also present in the entrances of the three sub-chambers, each of which also had a blocking-stone which closes most of the hole, but not all of it. (These stones now lay on the floor in front of the holes). This particular astronomical feature is similar to 'light-boxes' found in other passage mounds in Ireland and Wales (Newgrange, Carrowkeel, Bryn Celli Ddu). 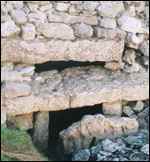 A similar feature is believed to have been found on the Orkneys at the recently destroyed/restored Crantit Tomb. 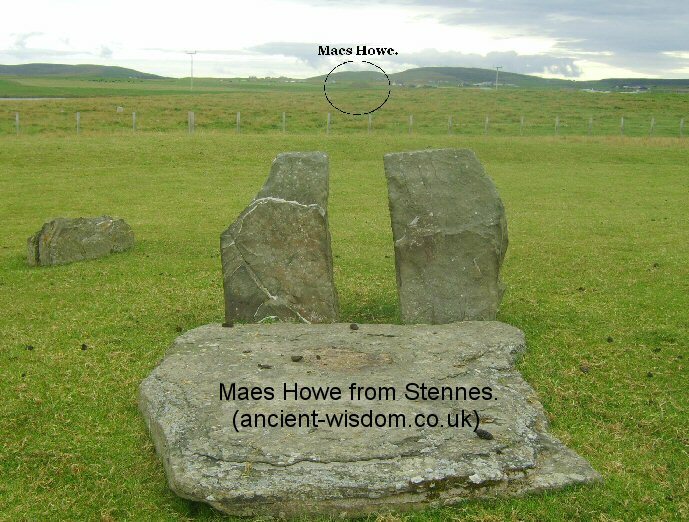 Maes howe has not been dated directly, but by association with the stone circle at Stennes nearby, and with the well known settlement site of Skara Brae on the west coast it is thought to have been erected about 3,000 BC. Meas Howe should not be viewed as an independent structure. It was an integral part of the prehistoric landscape, as the photo above illustrates. The whole area can be seen as an outdoor ceremonial arena, with the ever-present Hills of Hoy in the background receiving the midwinter sun and marking the new year. Archaeologists are currently investigating the causeway that links Stennes to Brodgar, where several large stones suggest a ceremonial route between the two sites. 1). D. Zink. The Ancient Stones Speak. Muson Books. 1979. 2). A. Service and J. Bradbury. Megaliths and their Mysteries. Macmillan Publ. 1979. 3). Trevor Garnham. 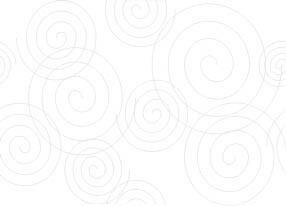 Lines on the Landscape, Circles from the Sky. Tempus Publ. 2004.